Using Quick Tasks is the easiest and the fastest way to use Smart OCR. The whole job is done with just several clicks. When you start Smart OCR for the first time the Quick Tasks panel will be displayed. You can choose from one of the predefined Quick Tasks and Smart OCR will do the rest of the job. If you don't want this panel to be displayed on program start up, you can remove the check from the Show on Start Up check button or from General Settings > Show on Start Up checkbox. You can display the panel at any time using the Tasks button from Document Panel. When you start a Quick Task the first step is to specify input image/images. Depending on the type of the task you can select image files, PDF documents or scan paper documents directly to Smart OCR. When the input is specified Smart OCR processes and recognizes the images automatically. After that a Save File dialog is displayed. The filters and the file type of this dialog is synchronized with the chosen task (for example if you choose to scan a document to PDF file, the output filter of the Save File dialog is set to PDF) so you can directly click on Save button of Save File dialog. If you need to change some of the settings before the export of the output file you can change them using the options on the Save File dialog. For additional information about these options see Save Settings. Scan to Microsoft Word - You have a paper document and you want this document in editable DOC format - no problem! First make sure that your scanner is turned on and connected to your PC, after that choose the Scan to Microsoft Word Quick Task. Smart OCR can acquire images directly from your scanner. When the scanning is finished the program will automatically recognize all of the pages and will prepare all of the recognized data for exporting in DOC format. 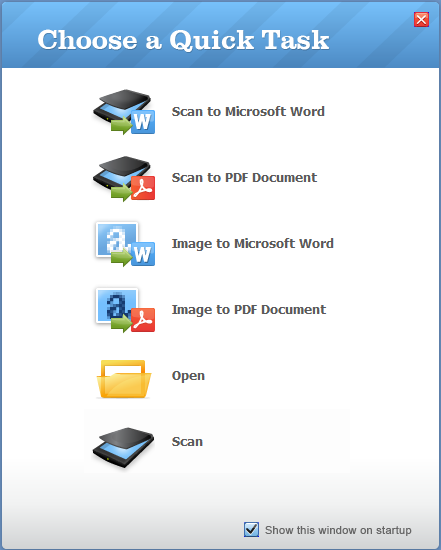 Scan to PDF Document - If you want to scan your paper documents to searchable PDF format, this Quick Task is for you. After you are sure that your scanner is ready, just select this Quick Task and Smart OCR will do the rest of the job. Image to Microsoft Word - Whit this Quick Task you can convert your image files to editable Word Document in no time. Just select the Image to Microsoft Word Quick Task and give the image file/files to Smart OCR. Soon your images will be recognized and ready to be saved as DOC file. Image to PDF Document - This Quick Task is designed to quickly convert your image files to searchable PDF Documents. Select the task and specify the image file/files that you want to recognize. Smart OCR will process and recognize them automatically for you. Open - Use this task when you need to recognize image file/files and want to save the results to one or more format. The task will display an Open File dialog and after selecting the files, the recognition and saving will be in manual mode. With this task you have more control on recognition and export. Selecting this task is equivalent to clicking on Open button from Document Panel. Scan - If you need to scan your paper document directly to Smart OCR this task is for you. In order to give you more control. After scanning the recognition and saving will be in manual mode and you will be able to save the recognition results in one or more formats of your choice. Selecting this task is equivalent to clicking on Scan button from Document Panel. Make sure that your scanner is connected and turned on. Also be sure to install the software provided with your scanner. Place your document face down on the scanner and click on scan button. The chosen Quick Task will start automatically when you close the scanning dialog.